At MidAmerica Basement Systems, we make it a priority to ensure that your basement windows are as bright, long-lasting, and energy efficient as they can be. Let our experts demonstrate how we can save you money by upgrading your basement windows. The quotes we provide for all basement improvements are free and come with no obligation. Each quote includes a professional on-site inspection, a customized cost breakdown, and a free copy of our 88-page book! To learn more, contact us today for a free basement window upgrade quote! 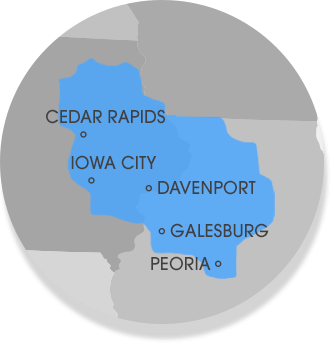 Our service area includes Peoria, Cedar Rapids, Davenport, Waterloo, as well as other areas in Quad Cities. If you have old, ugly, drafty basement windows, and your window wells are also in bad condition, these two important features are probably doing more harm than good. Instead of protecting your basement from exterior conditions, they're allowing excess moisture, humidity, and cold drafts to enter your basement, along with ants, termites, and other pests. Replacing your old, outdated basement windows with new, energy-efficient ones is a great way to add comfort, value, and energy efficiency to your home. When the time comes to make the upgrade, MidAmerica Basement Systems has the long-lasting, beautiful solution you need. Call or e-mail us today for a free basement window upgrade quote! Our quotes come with no obligation and include an on-site inspection and measurement, as well as our 88-page full-color basement finishing book. We proudly serve the Quad Cities area, including Peoria, Cedar Rapids, Davenport, Waterloo and many areas nearby.